This was our second trip to Sicily, the first one being to the South East, where we stayed at COS, and also visited Valle dell’Acate. 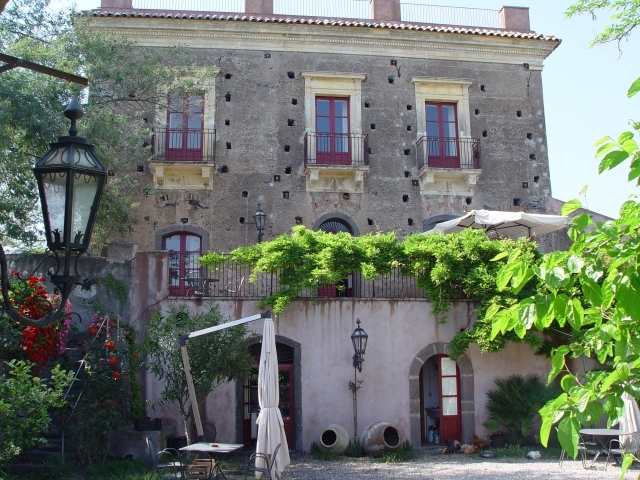 This time we were in the Etna region, and each place we stayed in contained a largely unrestored palmento – the local name for a wine production facility. We started with a few days at Fuedo Vagliasindi, near Randazzo. Fuedo Vagliasindi is now a hotel, but used to be the country villa of a powerful noble family. It is difficult to over-emphasise the scale of the palmento there, and easy to be impressed. Basically it occupies all of what appears to be the ground floor in the picture below. One thing I realised on this trip was that the basic pattern seems to change little, irrespective of how grand the palmento is. If you have a big important palmento, like this one, you simply scale up all the dimensions accordingly. So instead of the beam of the press having a cross-section of 50cm or so square, this one is closer to a metre square. And the size of the treading areas, tanks and barrel room are also scaled up accordingly. The palmento has three levels. The highest level is where the grapes are received from the fields. Here there is a staircase on the outside of the building, to the right as shown above, to enable the grapes to be dumped through windows and into the area where the grapes are trodden. Below you can see Ben (that’s our knowledgeable guide Benjamin Spencer of The Etna Wine Lab) ready to start treading, and helping indicate how massive the beam of the press really is. After treading, the must is drained into tanks at a lower level, to the left and back in the picture below, and the press is operated to help extract the liquid from the skins and stalks. Maybe I have been a bit slow on the uptake, but I always imagined that press worked by one end of the beam being pulled down to the floor by the screw. Actually, the screw lifts a large stone that is slotted into the floor, so it is the weight of the stone that ultimately determines the force on the beam, and that force will remain constant as long as the stone is suspended. If the beam end were simply pulled down against the floor, you would have to keep adjusting the position of the beam to maintain a constant force as the mass of skins and stalks compresses. 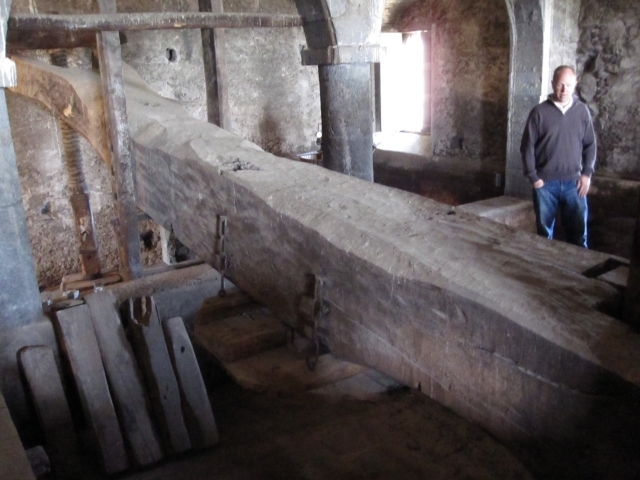 As Ben put it, using the weight of the stone enables you to set up the press and go to lunch. 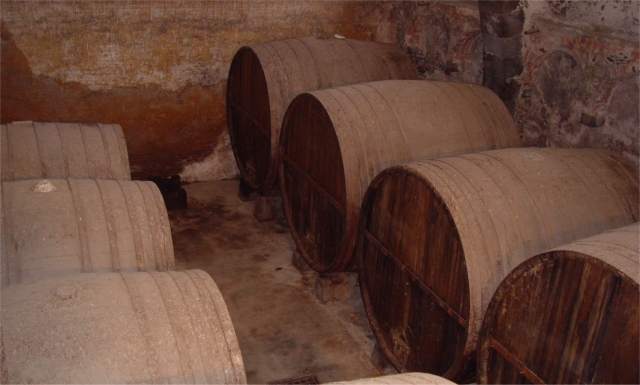 The last area of the palmento is the barrel room. This is at opposite the end to where the grapes arrive, and another level down, thus allowing the wine to continue to follow its easy gravity-driven course. Easy after some poor sod has initially lugged the baskets of grapes up the stairs, of course. Unfortunately, as far as the evidence in the picture goes, the barrels could be almost any size. Take it from me that they are on a scale appropriate to everything else – huge! Feudo Vagliasindi still has vineyards around the house and produces a wine under its own label. But that wine is now made just down the road at Tenuta delle Terre Nere, of which there will probably be more in a later post. The massive area occupied by the palmento is now largely unused, but thankfully still pretty much intact. After our stay at Feudo Vagliasindi to the North of Etna, we moved round to the South East of the mountain, near Zafferana Etnea, and stayed at La Rocca della Rosa. While not exactly what I would call small, this farmhouse was on a lot more intimate scale than Feudo Vagliasindi. The place is still run as a small farm, and it too used to have vines on its property. The vineyards are no more, but the house still has a palmento, now a bedroom suite for the agriturismo. The palmento occupies the room behind the two rightmost doors on the balcony shown below (one of the doors being largely hidden by the parasol). The internal height of the palmento is a little higher than you might think, extending to the bottom of the windows above. Here, grapes were delivered through a window to the back of the house, but with not so much distance for the vineyard workers to climb as the house is built on a slope. 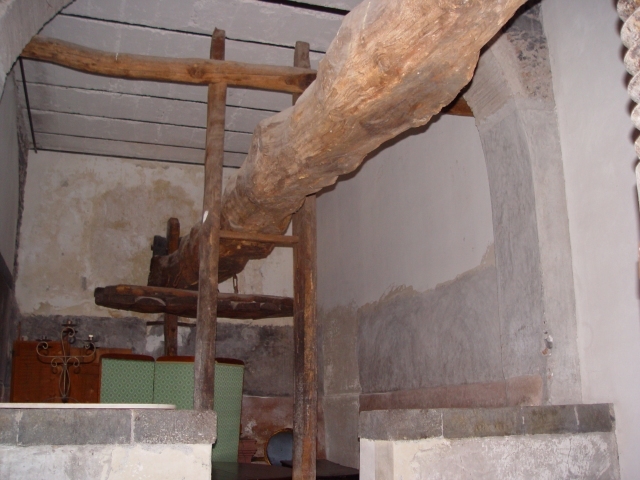 The barrels were kept on ground floor off to the right of the picture, a space now used as the agriturismo’s dining room. The palmento has been converted to a bedroom suite, and I was delighted that we got to stay in it. The palmento has not been messed around with much in its conversion, and some might like more creature comforts, but it is ideal for the wine geek, or anyone else interested in the history of winemaking on Sicily. 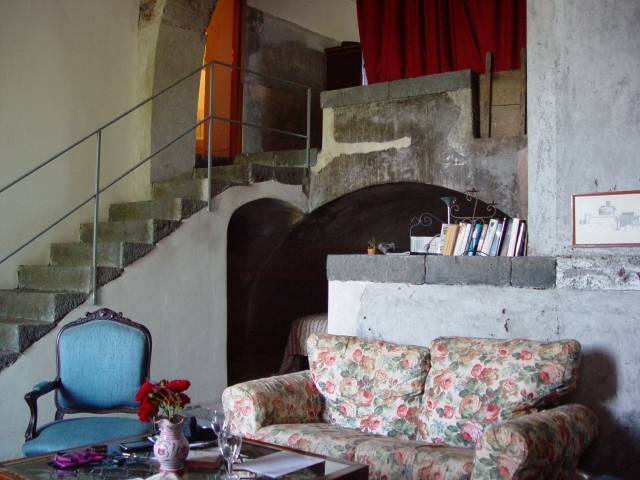 What you see in the picture below is the stairs up to the area where the grapes were trodden, now a double bedroom. Our bedroom window was where the grapes came in. In the arch was underneath is an area that used to be a stone tank, now a twin bedroom. To the right was another area that could be used as a tank, and the press, now mainly used as a storage area. One little detail, which I noticed only after a couple of days intimate contact between my bare feet and the palmento floor, was that the floor’s texture was different in different areas. Mostly the stone was rough-hewn, but relatively smooth – see below right. But in the grape-treading area, AKA the area between our bed and the bathroom, the stone surface had been deliberately roughened – below left. To the sole of my feet, the roughness felt a little spiky, and not entirely comfortable. Was that to help prevent slipping while treading grapes, I wonder? Or perhaps it reduced the chance of crushing grape pips. I understand that in the Douro (sorry for the quick change of country), wooden soles had nails hammered in for that purpose. I also wonder if all palmento grape treading area have this textured surface, and wish I had been more observant at Feudo Vagliasindi. This entry was posted in General and tagged etna, italy, sicily, travel. Bookmark the permalink.